Heat gas or charcoal grill. In large bowl, mix lime juice, cumin, coriander and salt. Stir in beans, avocado and cilantro; set aside. Clean and brush oil on grill racks. Place green onions on grill over medium heat. Cover grill; cook 1 to 2 minutes on each side or until grill marks form. Transfer to cutting board; cool 5 minutes. Cut onions into slices, and stir into bean mixture; set aside. In small bowl, mix taco seasoning mix, vegetable oil and chile garlic sauce. Rub flesh side of salmon with mixture. Brush oil on grill racks. Place salmon, skin side up, on grill over medium heat. Cover grill; cook 5 minutes. Turn salmon; cook 5 to 8 minutes longer or until salmon flakes easily with fork. 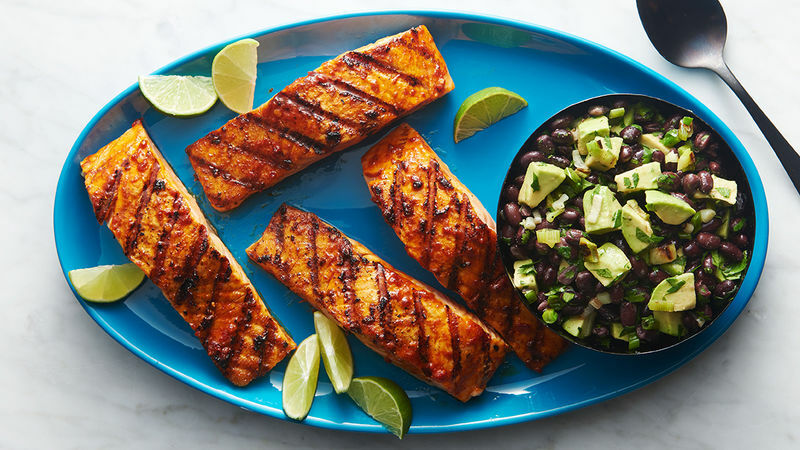 Serve salmon with Black Bean and Avocado Salsa and lime wedges. To dice an avocado in its skin, cut in half and remove pit. Use paring knife to carefully cut a crosshatch pattern in the flesh of each half, then use a large spoon to scoop the flesh from the skin. For best results when grilling fish, place fillets at a 45-degree angle to the grates of the rack so spatula slides easily underneath them. If the fillets are in line with the grates, the spatula will slide the fillet down the grates. If the fillets are perpendicular to the grates, the spatula will slide underneath them.